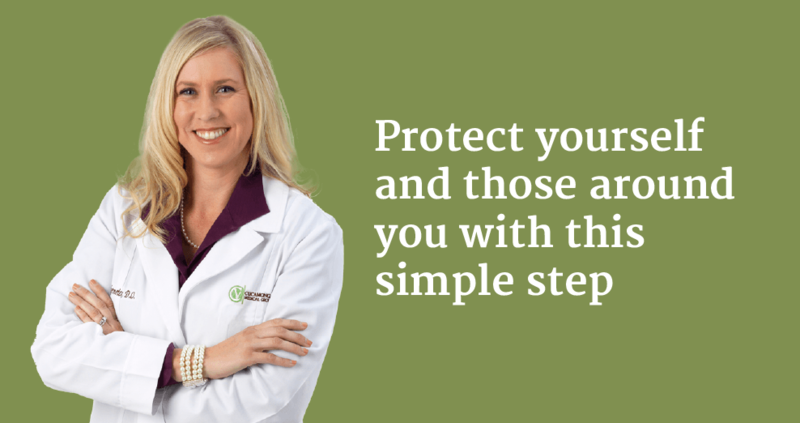 Want a simple tip to help you live longer and healthier? Get your Flu shot this season! 90 percent of pediatric deaths from the flu were in children not vaccinated. The elderly, babies, pregnant women and those with chronic illnesses are at the greatest risk. Give the gift of health this holiday season and protect those around you — we are contagious two days before symptoms ever appear. Wouldn’t you like to help keep babies, grandparents, cancer patients and transplant recipients healthy? Getting YOUR flu shot can help you do that! Even healthy people in their 20s, 30s, 40s, and 50s can get the flu, need to be hospitalized, or in the worst-case scenario, die from flu-related illnesses! At the very least, you will miss work or school or days with your family. The flu has a sudden onset of high fevers, cough, headache, sore throat and tiredness. With the flu you cannot get out of bed, and it lasts a week. You’ve got too much to do this winter, you don’t have time to be laid up in bed for a whole week. The flu gets blamed for many other conditions. The flu shot is not a one-stop-shop for preventing all winter illnesses. This is why many people claim to have gotten “the flu” once they’ve had their flu shot. Remember the shot is helping to prevent a life-threatening infection of upper respiratory system. It does not prevent coughs and colds. These typically are those three- or four-day bouts, those illnesses without a high fever, and those viruses that you can power through and still go to work and get out of bed. Again, the flu is seven days in length and is debilitating. Does the flu shot ever cause the flu? NO! The flu shot CAN’T cause the flu itself. It is not a live virus, so it can’t infect you. Also remember the description of the flu above. Many people say, “I got the flu shot, then I got the flu.” The flu figuratively feels like you got hit by a truck. A little fatigue, achy arm, congestion and general blah after a shot is a good sign, not a sign of the flu. This means your body recognized the virus and is mounting an immune response. Your body is doing its job and busy making a defense for the flu virus in case it’s exposed again so you can fight it off! In conclusion, it’s important to get your flu vaccine early because it may take up to two weeks for you to be fully protected. It is possible to be exposed to the flu if you got your shot late in the season and actually get sick with the flu within the first two weeks of getting the shot before your body has a chance to make immune cells to fight it off. To those that say, “It’s not effective, it won’t help anyway.” FALSE. Yes, the flu shot is a “best guess” for the strains that will be around this year and some years we are better predictors than others, but it always protects you. It can be the difference between a few days of illness that you can ride out at home or an admission to the hospital. To those that say, “I’m healthy… I’ve never gotten the flu… or I’ll just fight it off,” remember healthy people are dying of the flu too. Complications such as pneumonia or respiratory failure may strike people at any age in any condition. Don’t become a statistic. Get your vaccine today and protect yourself, your loved ones and your community. We encourage you to talk to your provider today if you have questions, but you can also schedule a nurse visit with no wait and protect yourself for the holiday season now!